This exceptional detached home is in 'as new' condition with well proportioned accommodation extending to c. 1950 sq ft. The high quality of finish and specification become immediately apparent on arrival to include the attractive brick finish, a tarmac driveway and a composite front door to the reception hall. Internally there are 5 bedrooms (4 being double bedrooms) and 2 plus reception rooms to include an ensuite master bedroom, the extensively fitted kitchen and a luxurious family bathroom. Externally there is a spacious enclosed rear garden and an aspect to the front overlooking the surrounding countryside. Being recently constructed the property also benefits from a high insulation specification and EPC so there are substantial energy savings to be made in comparison with many similar priced properties. As such we highly recommend inspection to appreciate this superb property and its choice situation. Exceptional detached home is in 'as new' condition. Accommodation extending to circa. 1950 sq ft.
5 bedrooms (4 being double bedrooms) and 2 plus reception rooms. High quality finish and specification throughout. Extensively fitted kitchen with an island breakfast bar area. Outlook to the front over the surrounding countryside. 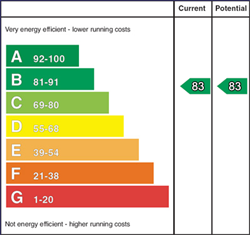 High specification insulation and EPC rating. Oil fired heating system - condensing boiler. Partly glazed composite front door and glazed side panels, contemporary tiled flooring, oak top balustrade staircase, cloaks cupboard and a separate cloakroom comprising a pedestal wash hand basin with a mixer tap, extractor fan, w.c and a contemporary tiled floor. Multi fuel stove in a traditional style red brick chimney surround with a mantle beam and a tiled hearth, wooden flooring, T.V. & telephone points and views to the front over the surrounding countryside. Contemporary tiled floor, T.V. point and french doors to the rear garden. With an extensive range of shaker style eye and low level units, bowl and a half stainless steel sink unit, ceramic hob, electric oven, stainless steel extractor canopy, integrated dishwasher, housing and plumbed for an American style fridge/freezer, larder unit, concealed display lighting, corner glass display unit, centre island/breakfast unit, T.V point and contemporary tiled flooring. Gallery Style Landing Area: With a large shelved airing cupboard. With fitted sliderobes, a high level T.V. point and an ensuite with contemporary fittings including a designer sink unit with a tiled splashback and storage below, w.c, extractor fan, recessed ceiling lights, tiled floor and a pod shower cubicle with an Aqualisa mixer shower and a glazed enclosure. With fitted mirrored sliderobes and a high level T.V. point. Contemporary suite including a panel bath with a telephone hand shower attachment, vanity unit with a mixer tap and storage below, recessed ceiling lights, extractor fan, w.c, partly tiled walls, tiled floor and a shower pod cubicle with an Aqualisa mixer shower and glazed enclosure. Insulated and a remote control sectional door, lights, power points, fitted double low level units, single bowl and drainer stainless steel sink, plumbed for an automatic washing machine and space for a tumble dryer. Spacious tarmac driveway and parking to the front. The rear garden is mostly laid in lawn with a panel fence border, a galvanised base for a shed and a paved patio area. Leave Ballymoney town on the Portrush Road continuing straight ahead at the roundabout on the A26 Frosses Road to the village of Ballybogey. Continue through the centre of the same passing the service station (on the left hand side) and then take the second left into Moorfields. Follow the avenue to the top and then to the left. No. 21 is situated on the left hand side.